Toss mixed greens with a mustard sauce and serve them with crispy fried pork chops! 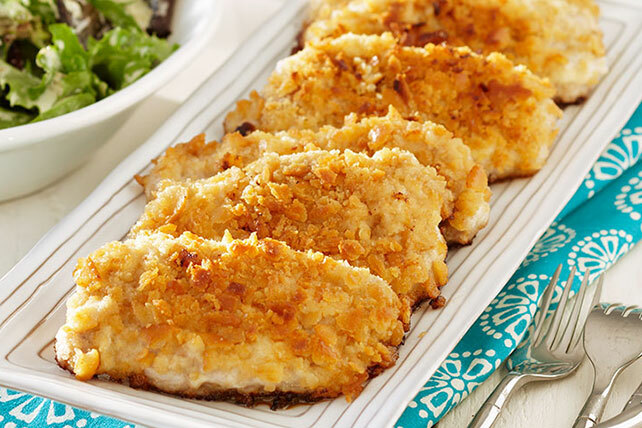 These Breaded Pork Chops with Mixed Greens are a great weeknight snack. Mix salsa, mustard and 1 Tbsp. mayo until blended. Spread chops with remaining mayo, then coat with cracker crumbs, turning to evenly coat both sides of each chop. Heat 1 Tbsp. oil in medium nonstick skillet on medium heat. Add chops, in batches; cook 3 min. on each side or until done (145ºF). Remove from skillet. Cover; let stand 3 min. Toss greens with salsa mixture. Serve with chops. Add 2 minced garlic cloves to the mayo mixture used to coat the uncooked chops. Prepare using KRAFT Lite Mayo Reduced Fat Mayonnaise. Serve with your favorite fresh fruit and cold glass of fat-free milk to round out the meal.